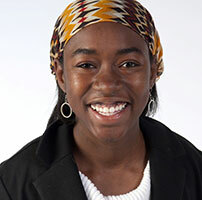 Astronaut Scholar Joy Buolamwini received the Astronaut Scholarship award while earning her bachelor’s degree in computer science at Georgia Institute of Technology. Since becoming an Astronaut Scholar, she worked with Yahoo, and alongside Google to develop mobile applications to record personal health information and increase responsiveness to warning signs of illnesses. After receiving her first award, Buolamwini became a Carter Center technical consultant to aide in the eradication of trachoma, an infectious disease that leads to blindness and affects 80 million people worldwide. She also represented the United States in a global student innovation competition in Hong Kong, and worked with social robots to develop early detection methods for autism. Now, Buolamwini has been awarded a prestigious Fulbright Scholarship that will allow her to serve as a United States ambassador in Zambia while researching the use of mobile technology to improve educational outcomes. “This scholarship has maximized my potential and pushed me farther than I imagined in my future contributions to American inventiveness,” she said.